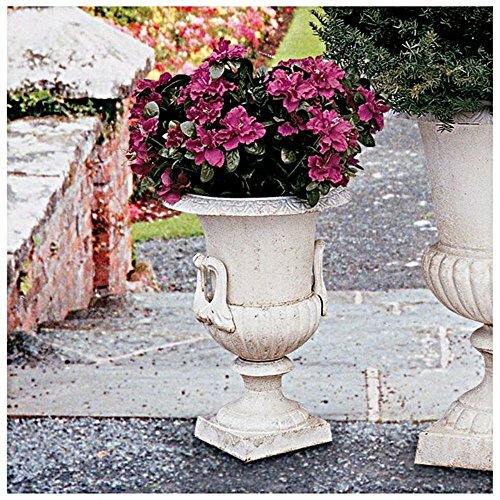 Our 17th-century cast iron antique replica spans the centuries and is substantial enough to be an heirloom into the next! This weathered, whitewashed cast iron work of art has a designer's touch of rust that makes it appear straight from an old French estate. Our unparalleled authentic urn causes its lightweight, local garden shop aluminum or plastic cousins to pale in comparison. The classically aesthetic features can certainly stand alone, but several together have stunning impact. Medium: 12and 1/2"Wx12and 1/2"Dx17"H. 36 lbs.